Item Size W 36" x D 10" x H 30"
Canadian made contemporary furniture that combines style and quality. 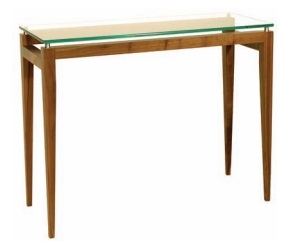 This Glass Top Console Table with one drawer is made of durable and noble materials, including glass and birch wood to achieve a perfect match between stylish design and clean lines. A great choice of colours and finishes allows for personalizing of each piece of our furniture. Available in Walnut wood.